Digital Mom Blog > Geekery > Saying NO To Mindless TV! Saying NO To Mindless TV! With kid #1 and kid #2, the first few months were spent holed up in the bedroom watching mindless TV in a sleepless induced trance. I jokingly told my husband a few months ago, PLEASE DO NOT ALLOW ME TO GET HOOKED ON SOAPS AGAIN when the baby arrives. Well here we are. Bambino has arrived. Our bedroom looks like a make-shift nursery with pack and play, swing and boppy laying next to me. I refuse to give into you mindless afternoon television. I watched enough stupid court television in the hospital last week – to know that this is not how I will be spending the next several weeks off from work. It’s only the 2nd week of maternity leave, but I want to make sure when I’m not bonding and spending time with baby that the time is spent well. I plan on learning Magento and Buddy Press – I can’t let my geek skills die out while I’m off of work! I’ve cracked out the camera and plan to capture as many moments as I can with this little fellow before he grows up! But most important I plan on spending time with this little heart melter and my other 2 lovies. It’s weird but wonderful being able to set new priorities in my life outside of the rat race and the daily grind of work. As much as I have a passion for my career, I must make sure my priorities are in order, mindless daytime television not being one of them! 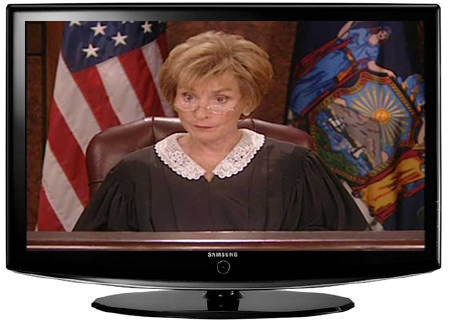 RANDOM FACT: Judge Judy’s salary is $45 million a year. Maybe rather than watching her, I should figure out how to become her. $45 million… wowzerz.